MDE Enterprises, Inc. is an IT manager training and development company started in 2000 with a simple mission – “helping IT managers of the world achieve more™ success”. 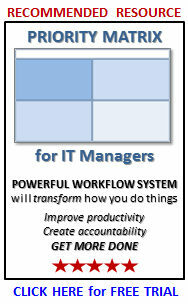 Thousands of IT managers in all parts of the world use our practical IT management processes and tools. Mike Sisco is the President of MDE and author of ITLever. His IT manager training programs and resources are based upon over 20 years of successful IT management and CIO experience. 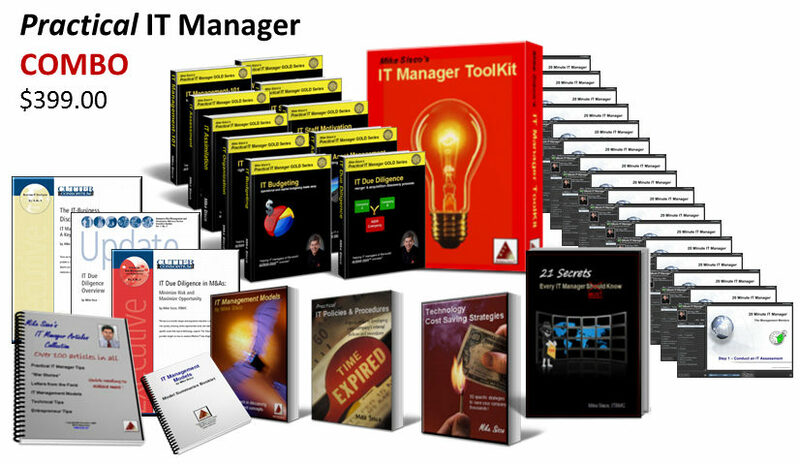 The IT Lever Blog is a venue for us to reach our vast audience of IT managers and company executives from all parts of the world as we strive to provide practical insights, tips, and tools to help you manage technology resources more productively and effectively. We are the founder of the IT Business Manager Certification, ITBMC. Our IT Manager Institute is delivered in many parts of the world and also available in an online Self Study option. In 2011 we began delivering the program via webinar so any IT manager in the world can receive this valuable training program. We hope ITLever gives you tangible value and helps you be more successful. For more information, see www.itmanagerinstitute.com. 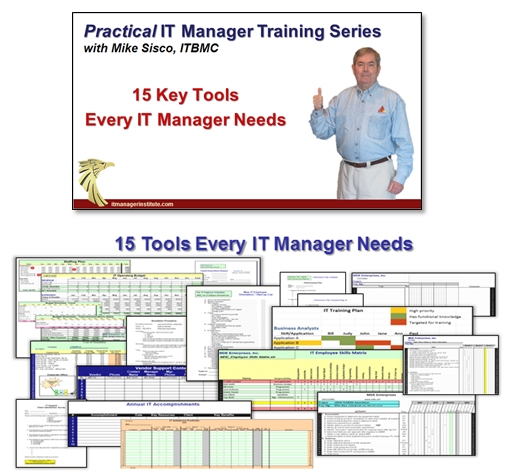 Mike, do you have training programs for Cloud Computing services outsourcing management for IT managers? Unfortunately, I don’t offer specific classes that focus on cloud services. It might be something to focus on later but for now I’ll leave it to others who are in that space already. Thank you for your comment and best of success. I have found that the resume’s of most of the CIO/IT Heads is very technical oriented and is not business oriented. We tend to highlight a lot about technology and the platforms used. Could you give us pointers/guidelines which should be followed for making the resume business oriented. Bikram, I would load up the resume with results I’ve obtained and benefits that give the interviewer reasons as to why the would want to hire me. Your new manager is either a senior IT executive or one of the company officers (CEO, CFO, etc.). If it’s a company officer, they don’t really understand nor appreciate the great technical background you might have. It’s also true of a CIO who might be interviewing you, , , the really good CIO’s do not just focus on technology, , , they deliver business value. Load your resume with business value achievements and what it did for your company, not technology knowledge. Business managers are looking for people who can get the results. The resume of a CIO/Head IT would be viewed by the CEO or the HR and we need to ask ourselves what sense will this make to a CEO reading it and wanting to hire you as a CIO ? The best advise that i was given was that i should try being a CEO and read the resume and then answer will you hire yourself at the CIO ? If the resume is full of technology and terms that mean nothing to the CEO or even HR. This will probably not get attention from large companies, they have choice. The small and mid-size companies will be enamored by the terms; that does not give you the opportunity a Senior IT Professional will be seeking. The challenge that most CIO/IT Heads’s are facing is that how to tone down the technical flavour and bring in business benefits to make their resume’s business focussed. Could you please share with us some sample resumes of CIO’s which we could use to restructure our existing resumes. Also inputs from other readers is more than welcome. I have been asked to review and approve a Global Governance Committee Management Policy which is based own making decisions by committee using input from s Working Committee. Committee decision making usually does not happen or it happens too late to drive the work that needs to be done. What do you think of Committee decision making and/or problem solving. What would be required to ensure Committee success? 1. The business is in the best place to know what needs to be a priority, , , not our IT organization. 2. The business needs to learn that we do not have unlimited resources and work has to be prioritized. 3. If we (IT organization) are left to prioritize these jobs on our own, we will never be as responsive as our business clients want us to be. Never! Clients will simply want everything completed “right now”. When your clients are in the middle of determining what gets worked on and when, , , it’s a struggle initially, , , but over time it simply becomes our normal process of how we manage the business. I can tell you that when the business units are making the trade-offs and are ultimately responsible for prioritizing the work, it makes life much better for the IT organization and easier to support the client in this area. I don’t believe all things work well in committees. We don’t run companies in a democracy, , , but when in places like programming support, strategic project initiatives, etc. a committee can be very helpful. I still like the fact that IT is represented as a full member of the committee and might even be the group who facilitates the meeting. Certainly, IT must be able to influence decisions but getting the client positioned to feel that they are more in the “driver’s seat” and in control of their own destiny is a good thing for everyone. When creating a committee, it is important to establish good guidelines that helps focus the members of the committee on the committee’s mission and objectives along with operating guidelines to work within. Be sure your committee is assigned a role that does not slow an organization’s responsiveness if responsiveness is a key measurement of performance. For example, in 1991 our company President created a senior management committee in March to focus on cutting company expenses during the 3rd and 4th quarter. We wanted to take the company public the following year and felt we needed to achieve major expense cuts in order to achieve our 3rd and 4th quarter finacial forecasts because of an expectation we would not achieve budgeted revenue numbers. This committee met initially to understand the issue and to identify a list of cost cutting ideas. We assigned each”cost saving initiative” to a manager from the group. We met a second time to deliver our recommendations for how much we could save in our assigned cost saving initiative areas along with how we should go after the savings and when we should be able to achieve the savings. When we all left the 2nd committee meeting, each of us had specific cost saving initiatives responsibility to make happen for our company and we were required to report monthly on our progress. We focused and tracked performance, and it was a huge success which positioned the company for a public stock offering the following year. Managers make decisions but a committee used properly can be very effective.